As I'm finally getting my new apartment in order I've been working on a few DIY things around the house. It's been a makeshift warehouse everywhere, but we're almost done. My favorite part? Our second bedroom, which me and my husband have turned into a little walk-in closet. I will definitely make a post on how I organized it to share with you guys. Today I'm bringing you guys a simple and easy DIY gold mirror frame. I'm also working on a DIY vanity area which I will also share with you guys and this mirror is part of it. 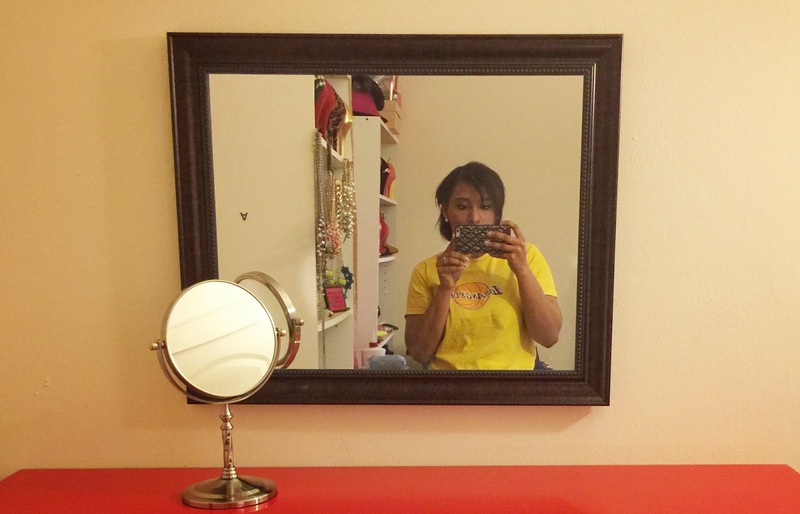 I purchased this brown framed mirror from Walmart for about $10. It didn't match my vanity color scheme I was creating so I decided to paint it gold to give it a nice touch. Gold is such a great accent color and I couldn't find a budget friendly mirror with gold so decided to take matters into my own hands. painters tape, scissors, paint brush, an old sheet and your paint. I purchased this paint from Amazon (Ceramcoat Metallic 14k Gold). I really love the finish it gives. First, I covered the glass part of the mirror with painting tape. When I did the edges, I cut them precisely to make sure they were perfect on the edges. Then I wiped down the edges and made sure it was clean before I started to paint. I put the mirror on an old box to have it elevated. I did this to make it easy to paint the bottom edges. I gave it one coat and then let it dry in front of a fan for about 15 minutes. Then, I gave it a second coat and let it dry overnight. Remove the tape, clean your mirror and lastly... take a #SELFIE!! I hope you guys liked this super simple DIY project. I can't wait to show you guys my new little vanity area I created soon. It's almost done! Have a great day loves. Thanks for stopping by my Kloset!